Maharaji addressed an audience that included faculty, community leaders, and students at Sanders Theatre, Harvard University. Harvard is the oldest institution of higher learning in the United States. It is also the first and oldest corporation in North America. 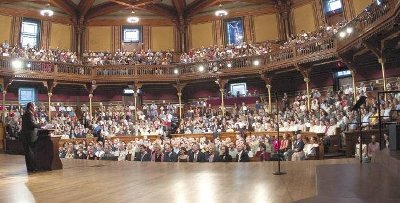 Many of the most venerable academic, political, and literary figures of the 19th and 20th centuries, including Winston Churchill, Theodore Roosevelt, and Martin Luther King, have taken the podium at Sanders Theatre. When it comes to theory, peace is a very complicated thing. The only thing you can do is to inspire people to find the way to feel peace, and that begins with presenting the picture of a possibility. To each person, there is a version of peace that applies to them. What is it? If you are a city dweller, you hear horns honking, sirens blaring, and everything going on all day and part of the night. Then on the weekend when you go to that quiet little place and there are no sirens, you say, “Ah, this is so peaceful.” That’s not peace. Absence of sounds is not peace. Absence of taxicabs honking is not peace. Absence of screeching tires is not peace. But getting away from that situation seems peaceful. These are individual variations of peace that people have. What is real peace—peace that is common to every single human being on the face of this earth? The generic definition of peace is the absence of war, but there is a peace that has nothing to do with arguments and nothing to do with wars. The resolution of conflict alone is not peace. There is a peace that is not temporary, not tied to politics, not found in the formulas of what the world thinks ought to be. It is not somebody’s vision, but resides within the individual, whether they are rich or poor, good or bad, right or wrong—even in their darkest hour, even when they are surrounded by an ocean of confusion and doubt. Maharaji was invited by the National Resource Centre for Value Education in Engineering to address a distinguished audience of faculty, guests and students at the prestigious Indian Institute Technology in New Delhi, India. IIT, Delhi is one of seven Institutes of technology in India. Maharaji's message was hailed as truly remarkable by the Deputy Director of IIT, Delhi. The other day I was asking someone who has also traveled a lot whether they had ever come across a thing called the world in their travels. He said, “No,” and I said, “Neither have I.” You come across countries, immigration, customs, people, taxis, animals—it depends where you go. But, world, I have never seen. It is people. It is people like you and me who need, not want peace in their lives. It is not a luxury. This is the missing piece of the puzzle. What we cannot imagine today will happen tomorrow. Technology will move on. Things we could never imagine will happen. What doesn’t change is the need. The wants change, but the needs do not. Maybe you are not comfordiv with your bed so you want a new mattress. The want may change, but the need is to go to sleep, and that does not change. Maybe you go shopping and you see a new water glass. You want the new glass, but why you need the glass does not change. That stays the same. Need and want. A lot of people are under the misconception that they want peace. It’s a misconception because peace is not something you want; peace is something you need in your life. Every day you wake up, something within you yearns to be fulfilled, to be happy, to be in joy. We create formulas for how to achieve that. Everyone has a formula: “I think if we do this, we can achieve it." I am not saying you should sacrifice one for the other. This is another wonderful excuse that people have: “I cannot engage in this search for peace because I have a family, and I have responsibilities.” I say to them, "What makes you think for a moment that you have to sacrifice one for the other?" The faculty at the Peace Studies Department of the Graduate School of Humanities and social Sciences at the Nova Southeastern University in Florida invited Maharaji to address a distinguished audience of students, faculty and guests. The university is the largest independent institution of higher education in the Southeastern region of the United States and is the sixth largest not-for-profit independent university nationwide. What I have to talk about is something very simple because it has to do with each one of us, with our existence, with the feeling of being alive. We do so much in our lives to fulfill ourselves on the outside. We create massive structures and institutions, all so we can be fulfilled. But do we have fulfillment in our life? Within our society we surround ourselves with niceties. And we also know that when it gets down to the sharp end of things, we must prioritize. My favorite color might be red, but if my house is on fire, any bucket will do. We all have dreams and aspirations, but what is our real situation? For each person, one thing that is real is the cry of the heart to be fulfilled. And inherently in the heart of every human being lies the possibility to be fulfilled. There is both the thirst to be fulfilled and the water that can fulfill the thirst. This is our true nature. So what is our priority? Often our priorities are the ones that the have established by the people we want to be like. But what is my own quest, my own desire, my own mission in life? As a human being I have a bias towards peace, towards joy. It is inherent, and it transcends the barriers of language and culture. Peace is not in far distant corners of this world; peace is within me. I don’t need to go to a mountaintop to feel it, or to turn down the boom box, or to travel to distant corners of the world. My peace is within. How do we connect with that peace? There is no formula. It begins with recognizing what it means to be alive, the importance of life itself. Peace begins with recognizing that the heart wants peace, that people have always wanted peace. This is not a new request. And peace is possible. Peace is a very possible dream, but it does not begin with nations or institutions. It begins with each one of us. When we start to say, “Yes, I need peace in my life, and let it begin with me,” we begin to perceive life differently. We begin to take responsibility for our innermost priority. And if the heart can be placed before everything else, what we have is a winning life. 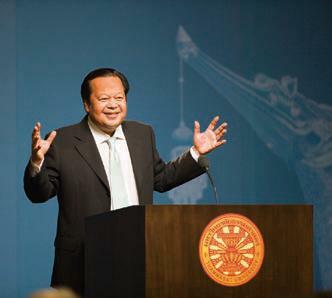 Maharaji was invite to present his message in The Hong Kong Polytechnic University. This university(PolyU) specializes in professional education in Hong Kong. The University's teaching units are grouped under six faculties and two schools; the Faculty of Applied Science and Textiles, Faculty of Business, Faculty of Construction and Land Use, Faculty of Engineering, Faculty of Health and Social Sciences, Faculty of Humanities, alongside with School of Design and School of Hotel and Tourism Management. The University is the sole provider of full-time degree or higher diploma programmes in Hong Kong in the areas of design, engineering physics, fashion and textiles, geomatics, international shipping and transport logistics, medical laboratory science, optometry, occupational therapy, physiotherapy and radiography. It is so important that we acknowledge the reality of this existence. We get so busy painting our ideas of how this life should be that we actually miss what is really happening. We walk with a bag on one side that is good and a bag on the other side that is bad. Everything we pick up goes into either the good bag or the bad bag. Take away the good and bad, and it is what it is. When you can see it as it is, it is beautiful. When you were young, you had this ability. You could see something for what it was- not good and bad, right and wrong. Maharaji addressed a standing-room-only audience faculty, students and guests. The university was founded in the 19th century to advance and impart knowledge across a comprehensive range of disciplines to benefit people by educating them in the accumulated knowledge of humankind. The University of Colorado at Boulder is a national comprehensive research university offering bachelor's, master's, and doctoral degrees in over 150 fields. Whether playing golf, flying airplanes, or thinking about frying chilies—whatever we do is made possible by the courtesy of this thing called life. We can do very little if life is not there. What is calling us? What is the aspiration of every single human being regardless of who they are, where they live, what they do, and what they think? What has our heart been saying through all the good and bad things that have happened? We have had a thirst, a desire, since we were very young. And no matter how old we get, that child is still there with the same thirst. Hope is within the heart of everyone wanting the same thing—to feel peace, joy, contentment. “Show me a way to turn within and feel for myself. Not some theory or nice words, but feel for myself, as real as feeling water in my mouth when I am thirsty.” Theory is great, but someday it has to become real. Could it be that we go along in our lives looking at our future and our past, not paying attention to the present? Yet we are stuck in the moment called now, and this is where we will be for the rest of our lives. All our tomorrows will come as now. We can only go one step at a time on this journey. We have the most priceless gift—breath. All the money and technology in the world can’t touch it. We cannot give it to someone else, steal it or borrow it. Breath comes freely, day and night. Because it does, we can dance, look, talk, dream—all the things we do. Some people ask why. But to the thirsty person in the desert, it doesn’t matter who built the well. All that matters is water and quenching their thirst. For those who are thirsty, I can help. It is your journey. I cannot make it faster or slow it down. I can offer you a mirror so that when you want to see your self, you can. Someday you may feel a need for a joy. And when you do, look me up. I can help. 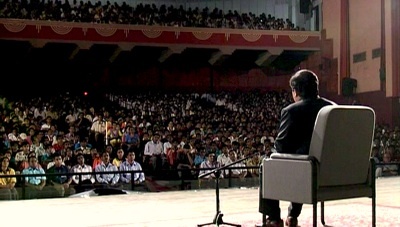 Speaking in Science city Auditorium in Kolkata, India, Maharaji inspired the young minds to take a peak within. Maharaji talked about the importance of this breath. The event started with welcome speech by the director of Bengal University. The University primarily provides education in the multidisciplinary fields of science, technology and management. It is popularly known as WBUT or UTech. Funded at the initial stages of its formation by the Government of West Bengal, the UTECH is set to become a Centre of Excellence in multidisciplinary science and technology areas of topical importance, in studies and research, in addition to providing adequate facilities for the pursuit of degree and advanced-level course in management, paramedical and other professional areas through its affiliated institutions. The University has been accorded the affiliating University status with its jurisdiction encompassing the entire state of West Bengal. Q: Many of us are becoming spiritual in order to search peace of mind. Do you think we are becoming selfish, or is it some kind of divine planning? A: Selfish is so relative! When we have the luxury of sitting somewhere. Then is it like selfish? If my action deprives somebody of something, then it selfish. But when I am going to discover myself, not the other person; who am I depriving of what? Secondly, the creator has given you gift of breath- Now give this to somebody else! You can't! Even if you want to, you can't. Is that selfish? It is NOT selfish. It is what it is. To search for yourself is not selfish, because you are not depriving anybody of anything. Q: Maharaji, my question is "What is true joy, and how can we experience this in our life"
So gunga gud khaaye ke, kahe kaun mukh swaad! How can I describe the experience of knowledge. When I cannot explain you the taste of Kiwi Fruit, how can I explain you the feeling of Self-Knowledge! You have to experience it yourself. This is the possibility. That is why it is so exciting! This is not a philosophy. I have not come to say "do this and that", and then disappear. No. I am not here to give you give an hour lecture "You should find the God within you. Ok kid bye!" "Nai, Main apne saare shubdon ke peeche hoon"- I backup up every word I say! And that is what makes it so exciting. Around the world - Saare Sansaar ke andar, Main logon ko ye dikhata hoon, batata hoon, aur anubhav karata hoon (I show this to people, tell them, and also make them experience this)! Q: In this world of inhumanity where the bloods are shed, and the wars are fought, which peace do you talk about. How is the peace possible. A: The real peace- not satisfaction. A peace that can be experienced in a battle-field. True freedom- A freedom that even a prisoner can feel in the middle of the prison. Someone who doesn't have peace, can only imagine what peace should be, or could be. Peace is not absence of war. Peace is not anti-corruption. These are pro-social things, good for society. There can be no war outside, but a war will rage inside you. The war outside can be ceasefire brought forth. But the war inside rages day and night. A true peace that is not absence of war, but a absence of war inside. Well, unfortunately that will be the last question. I am glad that you all were able to come. Thank you all, and many many blessings! 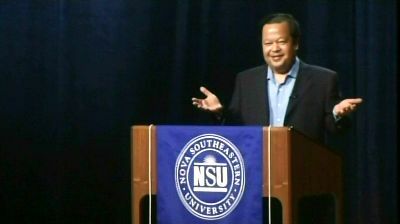 Prem Rawat was invited by leaders of Thammasat University to address a capacity audience of civic, government and academic leaders. The guests were welcomed by Manu Leopairote, President of the Economic Faculty Alumni Association of Thammasat, Permanent Secretary of the Thai Ministry of Industry, and Chairman of the Thailand Petroleum Authority. Mr. Leopairote is also Director for Thailand of the Asian Productivity Organization, a nonpolitical, nonprofit, intergovernmental organization contributing to the socioeconomic development of Asia and the Pacific by enhancing productivity. 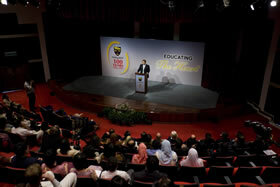 Prem Rawat was then introduced by Professor Dr. Surapon Nitikraipot, Chairman of the Board of Trustees, Rector of Thammasat University, and President of the Alumni Association. A professor of law, he is regarded as one of Thailand’s sharpest legal minds on public issues and has helped Thammasat become a voice of public conscience. Professor Surapon has served as a member of several committees in the Prime Minister’s Office, modernizing Thai law and developing the legal infrastructure. Thammasat University is one of the most prestigious universities in Thailand. More than 70 years since its establishment in 1934, the University has produced more than 240,000 undergraduate and graduate students who have greatly contributed to the development and progress of the society and the country. The University's alumni include prime ministers, top-level politicians and officers, Bank of Thailand governors, as well as most of the city's governors. 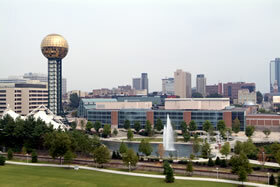 Prem Rawat responded to an invitation to speak at an event in the Knoxville Convention Center. More than 1200 people from Knoxville and the surrounding area attended the event. 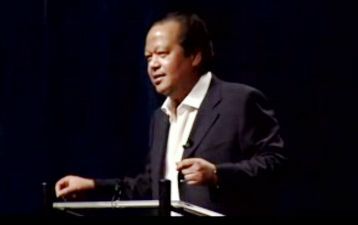 This was the first time Prem Rawat had given an address in Tennessee. Melissa Mann of nearby Maryville, Tennessee organized the event. The daughter of a former U.S. foreign service diplomat who served in several countries, Ms. Mann teaches English at a local college. "Knoxville responded very positively," Ms. Mann said. "People were very excited to hear that Prem Rawat had accepted our invitation, and a lot of people came to see him, not just from Knoxville, but Atlanta, Memphis, Birmingham - all over." “The freedom I talk about is not the kind of freedom that people think is freedom. People think freedom is when you get away from your house for the weekend. ‘Free—I’m free.’ To teenagers, freedom is when they leave their parents’ house. Freedom to parents is when their teenagers actually leave. Not just threaten to leave, but actually leave. ‘Now we are free.’ Is that freedom? “Freedom from my troubles. Is that freedom? Freedom from my concerns. Is that freedom? Freedom from my responsibilities. Is that freedom? I talk about a freedom that can be felt in a prison. That’s the freedom that no one on the face of this earth can take away from me. No one. That’s freedom. “Peace—a peace that cannot be disturbed. That is real peace. And one that cannot be taken away—that is real freedom. “Often, people think they’re free. And sometimes they’re trying to free themselves from their concepts of freedom. ‘Am I really free? If I think differently, I’ll be free. If I am open to everything, I will be free.’ This is our time to make that understanding happen. To begin to understand. And here is the concrete thing: To start to realize that all that we ever want, we have. We have that freedom inside of us. 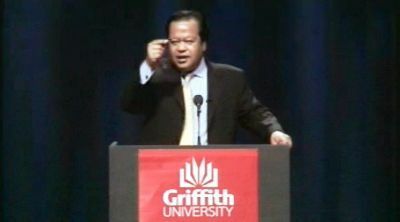 Maharaji addressed a distinguished audience of faculty, students and guests at Griffith University. He was thanked by a leader from the Australian Institute for International Relations. What i offer is to turn your focus within, so that you can feel that peace in your life. What you are looking for is within you. When there is no peace within, then there is wars outside. Inside, has to much to do with expression of what takes place on outside. Express then, your sincere desire to yourself for peace. Find that thirst that will lead you to water. I have nothing to sell. My speeches are not make you feel good. If it makes you think "I am alive, possibility of peace is there, and I am richer than i can ever imagine." Then the thirst will take over and it will guide you to water. If you take nothing from this event, then take this one thing - you need to have peace in your life, period. With my help, without my help - i don't care. Find it! And if you can't find it - I can help. And thats what its all about. Thank you very much. And i hope you give it, some thought. Griffith University is committed to high standards of scholarship, innovation, internationalization, social justice, ethical standards and lifelong learning. It consistently ranks high among Good University Guides, with the Griffith Business School ranking 11 in 2006. Maharaji addressed leaders and prominent members of the Miami community as well as members of Miami Dade College’s faculty at the James L. Knight Centre, Miami's largest auditorium. 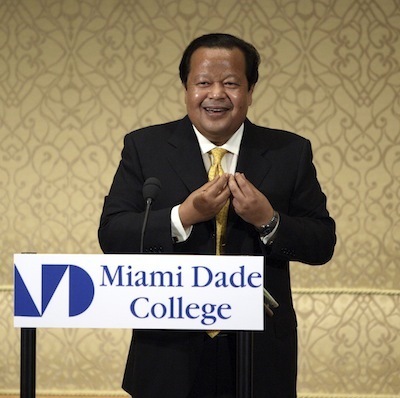 Responding to an invitation from Dr. Eduardo Padrón, President of Miami Dade College, Prem Rawat, known also as Maharaji, addressed a distinguished audience of faculty, guests, and students at the James L. Knight Center, Miami’s largest auditorium. MDC is the largest institution of higher education in the US with 163,000 students from 170 countries. The event benefited the World Food Programme (WFP). The Foundation’s contribution will provide food for 4,500 schoolchildren in Guatemala for a month. The sponsors for this event included Bell South, the Human Services Coalition, Mahoney Cohen, Grubb & Ellis, the City of Miami, the Four Seasons Hotel, and Miami resident artist Romero Britto. 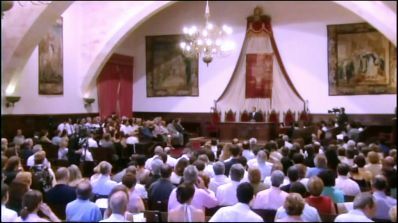 Prior to the June 16 event, Dr. Padrón awarded Prem Rawat a key to the City of Miami on behalf of Mayor Manny Diaz before a group of Miami government, civic, and business leaders. 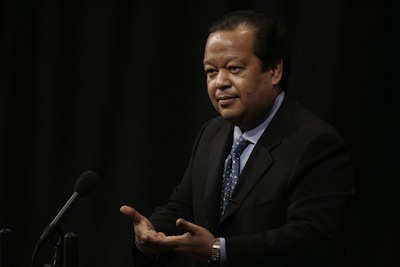 Maharaji addressed students, faculty and guests at the University of California at Berkeley. The University was once described by the Oxford scholars as the Home of science and seat of the muses. It was founded in 1868 in a merger of the private College of California and the public Agricultural, Mining, and Mechanical Arts College. By the 1930s, Berkeley had established itself as a premier research university, and today counts sixty-one Nobel Laureates among its faculty, researchers and alumni. I travel all over the world, but I don’t go to see countries. I have never seen a place I could call a country. What I see is people. We may relate to ourselves by our language, our culture, or our religion, but we are essentially the same. We have the same aspiration. We all want peace in our lives. We have thousands of explanations for war, but not one why we should have peace. We’ve got a problem here. When it comes to war, there is a lot of active participation. We create new weapons and train people to use them. When it comes to peace, we wait for the clouds to part or a magic wand to be waved so then there shall be peace upon earth. I don’t understand. If war requires active participation, which it does, then peace requires active participation as well. And that active participation is not going to happen by having a lot of debates. It is a matter of uncovering and looking at the reality of people, at what people want whether they are rich or poor. We have learned about how we are different, but we haven’t learned how to look at another human being like ourselves. It takes active participation, and that begins with recognizing our own thirst. Once we can recognize our thirst, water becomes important. What kind of thirst is this? The thirst that says, Understand the preciousness of life, of each breath. How does that happen? It is like learning to ride a bike. You get on and you are told to pedal, look forward, and balance, but you can’t do it all and you fall. Then comes a moment when you have it. You take off, and there is no looking back. From that moment on, you have achieved your sense of balance. This is what I am talking about. Achieving that sense of balance in your life. The very thing that says, Get in touch with your self, or what Socrates calls, “Know thyself.” Do. When you find that balance in your life, it makes a difference. Maharaji was invited to present his message to the heads, lecturers and young students of Malaya University (Kuala Lumpur). Vice Chancellor, Captain Dato’ Professor Dr. Hashim Yaacob, describes Maharaji's message to be intriguing. The University of Malaya (Abbreviation: UM; Malay: Universiti Malaya) is the oldest university in Malaysia. The university motto, Ilmu Punca Kemajuan (Malay: Knowledge is the Key to Success), reflects the philosophy of the University in its constant endeavor to seek knowledge in all fields to produce successful graduates and a successful nation. UM is widely recognized as one of the top universities in Malaysia. 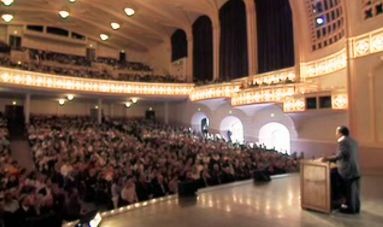 On June 29, 2012, Prem Rawat was the keynote speaker at an event called “Notes on Peace,” held at Moscow’s nationally renowned Library of Foreign Literature. The event was co-sponsored by Synergy, Moscow University of Business and Finance (MUIF); and the Ismail Akhmetov Foundation. The Library of Foreign Literature, as well as housing five million books in one hundred and forty-five languages, acts as a center for cultural and international relations. 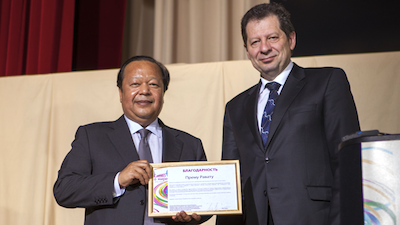 On his first visit to Russia, Prem Rawat was greeted by some of Moscow’s leading academics and university students interested in exploring the subject of peace. Opening the event was a virtuoso pianist who played a beautiful Tchaikovsky sonata, giving a uniquely Russian ambience at the library theatre. University students then asked questions both about Russia and the day-to-day challenges they faced. One student asked whether The Prem Rawat Foundation’s very successful Peace Education Program, which is being pioneered in prisons in many countries, could work in Russian prisons and also how personal peace can be achieved when external circumstances can be so challenging. 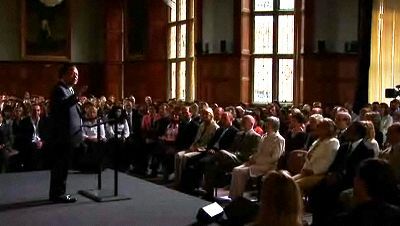 Maharaji addressed a distinguished audience of faculty, students, and guests at Oxford University. He said "The peace you are looking for exists within you. Have the tools you need to accomplish the aspirations of your heart, regardless of all external circumstance." The University of Oxford, located in the city of Oxford, Oxfordshire, England, is the oldest university in the English-speaking world. The university traces its roots back to the end of the 11th century. What I have to talk about is really quite simple. It deals with one human being—one person, one individual, who breathes, thinks, wants to understand, wants to learn. Sometimes, in the pursuit of all that we pursue in this world, we forget about us. Who am I? Who are you? You are unique. There is no one like you. I cannot emphasize enough the uniqueness of every human being on the face of this earth. The idea of peace is not new. I’ve been talking about peace since I was a child, because I know that there is another face of peace. There is an idyllic face of peace that people paint in which nobody is fighting with anyone. But there is a face of peace that does not rely on boundaries. There is a face of peace that has nothing to do with obedience, nothing to do with your wishes. It is the face of peace that lies in the heart of every human being. This is the possibility, the reality, that certain people have always envisioned: “Know thyself.” The resource of the joy, the peace, you are looking for exists within you. You have the tools you need to accomplish the aspirations of your heart, regardless of all external circumstances. Are you in peace? Are you content, not by thought, but by feeling? There cannot be a formula for peace: “I am content because I did this and I did that and therefore, everything is fine.” It has to be a reality. My message is not connected to a religion. My message is connected to getting in touch with your heart, to understanding the value and the preciousness of your existence. It is about addressing, rather than covering up, the fundamental needs that you have as a human being—needs that are the same for everyone.